DOTmed is the world's leading public trading platform for medical equipment, parts and services. 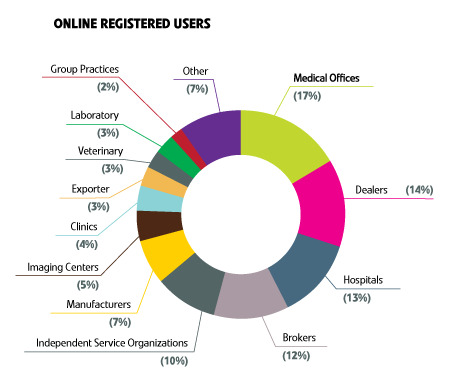 An industry-leading 22,000-plus visitors come to DOTmed every weekday to shop for and buy what they need — and up to 90% of them are healthcare providers and end-users. We also reach out to our more than 270,000 registered users through our news, emails and equipment alerts. Our media rates are very competitive and we deliver the demographics you need - decision makers with purchasing power. 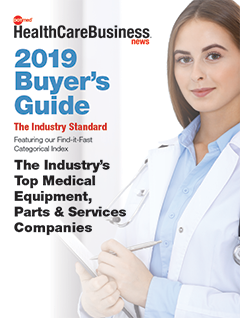 Classified Equipment & Parts Listings - Select from over 500 Equipment & Parts Categories on DOTmed - you can list your equipment for free, or choose one of our "Good, Better, Best" Upgrade Options for maximum visibility and sales. Featured Listings - Sell your product faster! - utilize this premium listing location for greater search-ability. Blue Book Price Guide - Offered only to the Premium, Enterprise and Ultimate Package holder the Blue Book gives you access to a database of over 32,000 successfully sold items (more added every day). 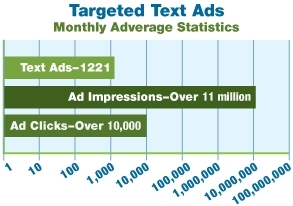 Targeted Text Ads - One of our most popular ad options -- advertise within our more than 500 main Equipment Category Listings and enjoy absolutely precise, on-target efficiency. Check your number of 'views' and 'clicks' online anytime! Elite Upgrade Packages - If you're committed to growing your company and your sales, one of these Elite Level Packages will give you the online functionality you want. The Enterprise Package is a great way to maximize your DOTmed presence and take advantage of all DOTmed has to offer. The Ultimate Package is for next-level listing and company management. 摩天大楼Ads在主要设备&零件页 - DOTmed's Equipment & Parts pages are an advertiser's dream: they deliver an audience of serious equipment shoppers - and that audience is buying exactly what you sell. It's where the more than 22,000 daily visitors to DOTmed go, and Google sends thousands of people to these pages every day, all day long. DOTmed WebStores - If you list multiple items on DOTmed, open a low-cost WebStore and let Buyers see all your listings at once - it's easy to email too! OEM New Product Listings & OEM WebStores - We give OEM listings a unique design that makes them stand out in front of our more than 22,000 visitors each weekday, many of whom are buyers from hospitals. Add an OEM WebStore and you have a complete cross-selling presentation. Leaderboard Banner Ads Dominate any equipment category and build your brand. Mobile Banner Ads - Mobile Banner ads are available in numerous locations throughout DOTmed's Mobile site. Target users who are in 'buy now' mode on their mobile phones. HCBN Homepage & News Slider - This online and print placement includes your ad on DOTmed's homepage, DOTmed News Homepage, News Silo pages and within Healthcare Business News magazine. Resource Guide Homepage Slider - This combination of online and print placement includes your ad on DOTmed's homepage and within Healthcare Business News magazine. Buy Now Powered Listings - Have a "Buy Now" button in your DOTmed Listings powered by PayPal or Stripe. Buyer's can purchase directly from your DOTmed listing page when you have "Buy Now" buttons activated. Virtual Auction Houses(Bidding) - If you are an auction company or running a close out sale use DOTmed's auction platform to reach our qualified buyers. You provide the inventory and DOTmed creates your auction event. All bidders are pre approved and registered users. You collect payment and provide logistical support to successful bidders. Virtual Auction Houses(Non Bidding) - If you auction medical equipment - in a brick & mortar setting or online - you can leverage DOTmed's unequalled industry traffic of 22,000-plus daily visitors by opening a DOTmed Virtual Auction House (VAH). Weekly Emailed News Ads - Put your Banner Ad or Text Ad on the Front Page of our Emailed News and get seen by approximately 42,000 potential customers each week. E-Advertorials start on the Front Page and expand to any length you want. Weekly Emailed Euro News Ads - Put your Banner Ad or Text Ad on the Front Page of our Emailed Euro News and get seen by more than 6,000 customers in Europe each week. E-Advertorials start on the Front Page and expand to any length you want. Emailed Equipment Alerts - Over 26,000 DOTmed users opt-in to get Weekly Equipment Alerts, so those users will open these emails and see your ad. Stand Alone Email - Want to reach a specific audience with full share of voice? Send a sponsored email through DOTmed to a specified target group to get your message across. HCBN Magazine Resource Guide - Advertise in print and online with a Resource Guide combo plan. 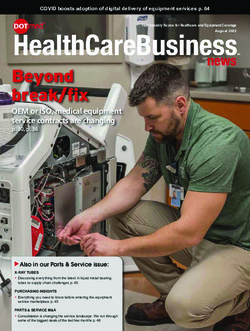 Appear in every issue of HealthCare Business News magazine and appear on DOTmed.com's home page.